Tradify is an easy to use job management software designed for service and trade businesses, available to use on PC, Mac, mobile, and tablet. You can track every job from quote to invoice. The app also helps you manage your workflow by tracking your team and jobs at all times. You can see who’s doing the work in real time. You can use Tradify to remain organized and on top of your business. Manage your workforce smartly. Tradify helps your team arrive on time every time and assess the availability of every team member to book jobs as they come in. Quote jobs quickly and accurately. Tradify helps you make quick turnarounds on new jobs, get the quote out faster, and easily acquire new customers. Invoice easier and get paid faster. Tradify helps you manage your invoicing by collating timesheets and receipts for instant invoicing. This makes it easy to get paid faster. You can integrate Tradify with Xero or MYOB accounting software. It helps keep your books tidy by carrying invoices over to your existing accounting software through seamless integration. You can work anywhere, from any device. Tradify keeps all your job information secure in the cloud, so that you and your team can easily regardless of where you are. You can track every job from quote to invoice. Prioritize jobs – see what’s due, overdue, or where to work next. Get a complete overview of your workload. All your job information is easily accessible by office and field staff. You can manage your workforce smartly with easy employee scheduling. Get rid of the paper trail – consolidate all your documents, emails, quotes, and notes in one place. Assess the availability of every team member to book jobs as they come in. Make use of the time tracker for time on site. See what each staff member is up to with real time status tracking. You can utilize easy and quick dispatch and rescheduling. You can import supplier price lists for up to date costs. Create kits for rapid quoting of similar work. Make use of customizable templates for different customers or jobs. Compare quoted and actual job costs. You can invoice right after the job. Transform timesheets and receipts into invoices. Make use of flexible invoicing variables. Send invoices directly to Xero or MYOB. Push and reconcile sales invoices to your accounting system in one click. Sync customers and contacts between your accounting system and Tradify. Reconcile bills in your accounting system – avoid double entry. Sync price lists from your accounting system to Tradify. See your day at a glance. Add purchase orders, notes, quotes, and images to jobs from the app. Easily communicate job information between the office and field. Capture time easily with a time tracker. Sign quotes and job sheets digitally. Make use of quote and invoice jobs on the go. Each company has different requirements and needs a system that can be personalized for their size, kind of employees and buyers, and the particular industry they are in. For these reasons, no platform can provide perfect tools out-of-the-box. When you try to find a software app, first be sure what you need it for. Read some Tradify reviews and ask yourself do you want basic tools or do you want advanced functionality? Are there any industry-specific functionalities that you are looking for? Obtain the answers to these questions to assist your search. There are lots of factors that you need to consider and these include your finances, specific business requirements, your company size, integration requirements etc. Take your time, use a few free trials, and finally choose the system that offers all that you want to boost your firm competence and productivity. 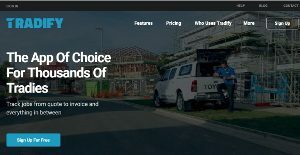 How Much Does Tradify Cost? We realize that when you make a decision to buy Field Service Management Software - FSM it’s important not only to see how experts evaluate it in their reviews, but also to find out if the real people and companies that buy it are actually satisfied with the product. That’s why we’ve created our behavior-based Customer Satisfaction Algorithm™ that gathers customer reviews, comments and Tradify reviews across a wide range of social media sites. The data is then presented in an easy to digest form showing how many people had positive and negative experience with Tradify. With that information at hand you should be equipped to make an informed buying decision that you won’t regret. What are Tradify pricing details? What integrations are available for Tradify? If you need more information about Tradify or you simply have a question let us know what you need and we’ll forward your request directly to the vendor.